Every so often, we get requests for quotes from our frame shop clients to take on large custom framing projects that are too large for those shops and their facilities to handle. Last October, we quoted out one such job that, by April of this year, turned into reality. 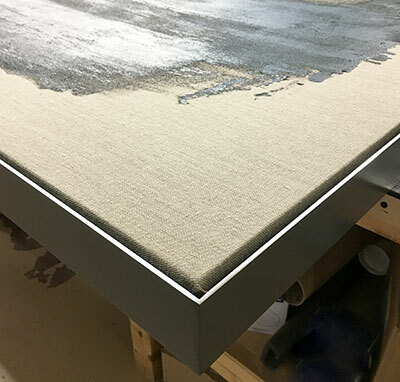 The scope of the project involved stretching and framing three works on raw linen by New York-based artist Christine Corday, whose prolific artwork ranges from paintings to large-scale sculptural installations that are located in private and public spaces around the world. These three works from her Heldan series were bound for a residence in southern California. The pieces ranged in size from 4’ x 8’ to 8’ x 10’. We would mill from scratch and build the stretcher bars, as well as fabricate frames: two of which were to be welded aluminum floater frames and the third, a float frame from maple with an ebony finish and white gold leaf accent on the face. Marking off where the edge of the stretcher bars would be, aligning to make it square and measuring for both bars and canvas. We spent the better part of a spring day with artist Christine, who drove her paintings up from New York the same morning, measuring each of the three paintings: Heldan I, Heldan II, and Heldan III, and discussing our strategies to achieve her vision of the pieces once framed. 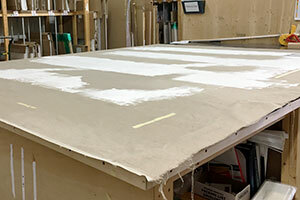 We were careful to note where and how she wanted the raw linen canvas aligned and situated on the stretcher bars. 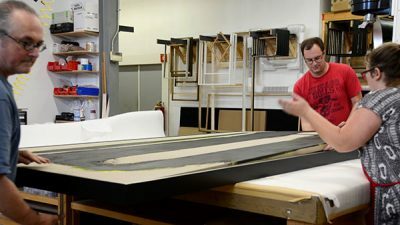 As a part of the design stage, we needed to make sure the depth of the frames exceeded that of the stretcher bars in order to protect the artwork and to be of the right scale for the paintings. We would make the stretcher bars at a depth of 2” in order to ensure their strength at such a large size, which meant the (also 2″ deep) aluminum we normally keep in stock would not be deep enough to accommodate the stretcher bars, the thickness of the canvas fabric on the underside of the bars and still recess the artwork by the requisite 1/8″ from the face of the frame. In order to make this all fit in the frame the way we needed, we special ordered 3” deep aluminum stock from our vendor, which allowed us to control exactly where the canvases would drop into the frames. The single maple float frame would be a much easier depth to accomplish, because we handle maple in a variety of scales frequently. 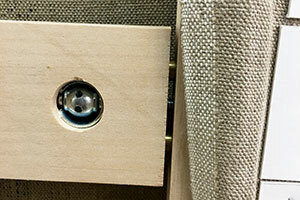 A close-up view of tight joint fasteners in action. 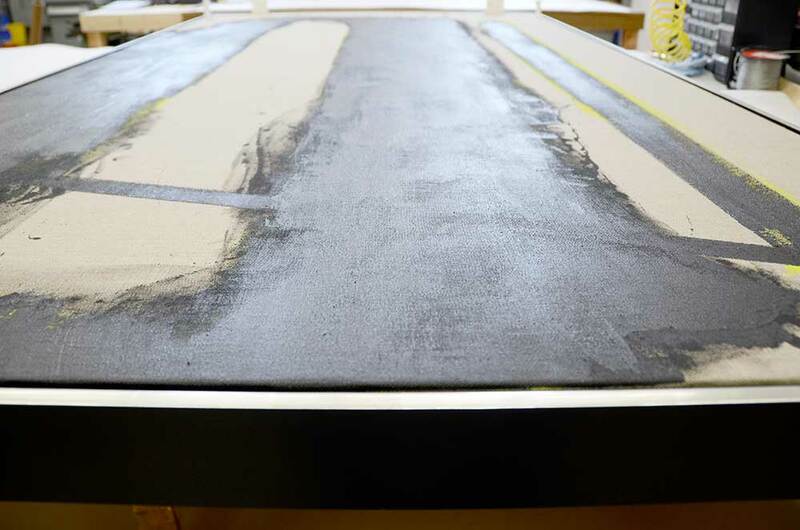 When fabricating our stretcher bars, we are able to make them using a system of mechanical tight joint fasteners, which are often used in cabinetry making and allow for us to create a taut, “drum”-like surface in a large over-sized canvas. These fasteners are used in each “joint” created by the corners of the stretcher bar and the cross bars that are necessary to keep the stretcher bars from bowing. Cross bars and tight joint fasteners also ensure that the stretcher bars are squared up and the stretched canvas remains taut. For an example, Heldan III, which is the largest of the three paintings coming in at over 8′ x 10′, had 12 fasteners, or connections, one at each point where the stretchers meet in the corners and one at each point where the two vertical and two horizontal cross braces join with the outer stretcher bar. Welding the two aluminum frames was – for us – the easy part, but getting the fully welded aluminum frame out of our steel room required us to cut a hole above the doorjamb in order to maneuver it into the fitting area. The Maple Ebony float frame took a few full days of work for our gilder to complete the white gold accent on the face of the frame. You can see it best on the feature photo at the top of this post. Fitting “Heldan II” into its white gold leaf accented frame. Once we nailed down the sizes, we built the bars and the frames pretty close to the same time, one painting at a time. After frame and matching stretchers were ready, it was time to get to work stretching fabric over bars. A good portion of the stretching was led, if not done, by ASF owner Mark, who is a painter himself and has over 35 years of working with paintings and canvases in a framing capacity. Mark, along with our fitting and preparatory team, painstakingly stretched, and at times re-stretched each painting around its bars. For Heldan III, they added fabric along the top edge of the painting in order to pull the canvas around the bars as the linen had been cut unevenly and too close the image area. This extra fabric allowed the linen to be completely stretched tight around the edge and stapled on the back of the bars. The method of strip-lining we use is labor-intensive, but worth it, as the materials used are archival and the process is completely reversible. 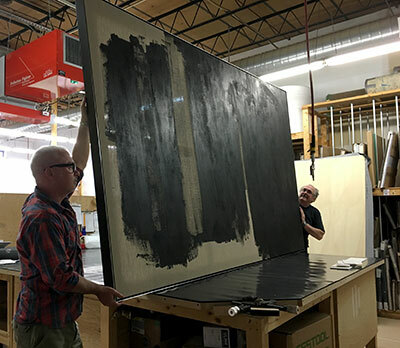 Once a painting was stretched around its bars, we fit it into its frame – taking at least three people to heft the stretched canvas into the frame. Close up of the welded aluminum frame on “Heldan I” featuring coal lacquered sides and a polished face. After each piece was fit, we packed it to be transported across the country via U.S. Art. 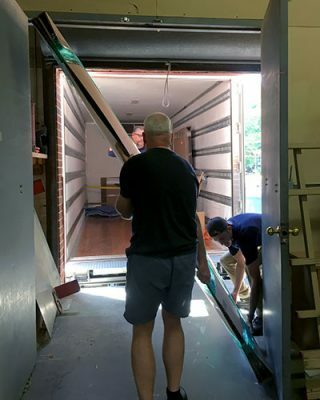 Since U.S. Art is one of the best white glove, gold star level of art transport companies in the country, we weren’t required to build wooden crates to ship the framed works; we instead soft packed them in foam and cardboard with carrying straps to help with moving the huge pieces. “Heldan III” loading into U.S. Art’s truck for transport. All three Heldan works are at this point in route to California. We hope to receive photos of them installed and if so, we will update this post. In the meantime, take a look at Christine Corday’s works and scroll through the gallery for a photo of the artist with one of her works on linen for scale. Framing artwork of this size and scale is always a challenge. But this was a challenge we were honored to take on. We only hope the new owners love and enjoy these paintings for many years to come and we sincerely look forward to working with Christine Corday again in the future. (Trying) to show off “Heldan I” after it’s been fit. Be sure to check out the our time-lapse video of the process of stretching Heldan III from start to finish here!